On Sunday September 16th at 2pm, the Newport String Project brings a dynamic program of string quartets to the Ilgenfritz Gallery. Project directors and violinists, Ealain McMullin and EmmaLee Holmes Hicks will be joined by Ethan Wood (viola) and Zan Berry (cello). Don’t miss an unforgettable afternoon of chamber music exploring works by Haydn, Shostakovich, Schulhoff and Mahdis Golzar Kashani. The concert will open with Haydn’s exuberant String Quartet in C Major, op 20, no 2. The opus 20 quartets (also known as “The Sun Quartets”, after the cover illustration on the first edition) surpassed any that came before in terms of scope, expressive range and musical sophistication. Shostakovich wrote his remarkable third string quartet against the backdrop of World War II and increasing political pressure on artists and scientists. The piece was thought to include coded criticism of Stalin’s regime. The concert will also feature music by Erwin Schulhoff, a Czech composer heavily influenced by jazz and ragtime whose life was cut tragically short by the rise of the Nazi regime in Germany. To mark the opening weekend of the Newport Art Museum’s Shape of Birds exhibition, the concert will include an evocative piece inspired by Persian folk music, by emerging Iranian composer Mahdis Golzar Kashani. 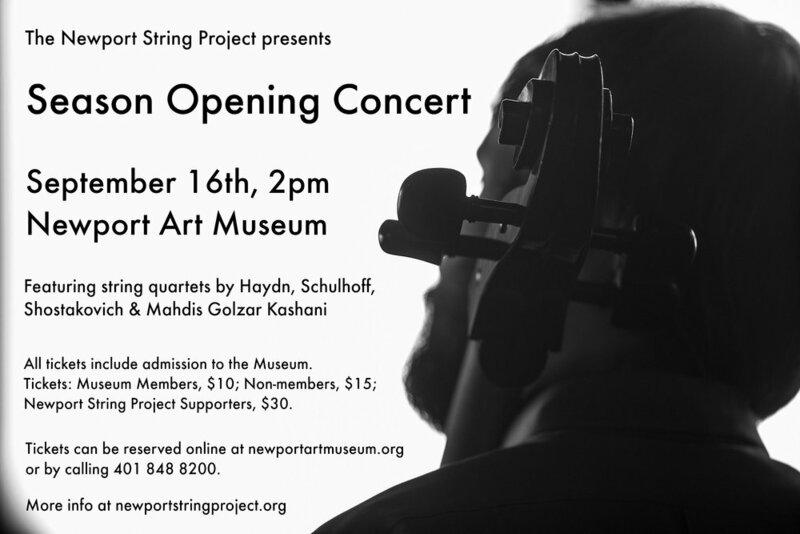 TICKETS: Museum Members: $10; Non-Members: $15; Newport String Project Supporters: $30. All tickets include admission to the Museum. Noted for its eclectic and innovative programming, the Newport String Project is committed to presenting highly expressive performances of masterworks, alongside works by emerging and rarely heard composers in intimate, inclusive settings throughout Newport.